The Bill Cunningham New York documentary was amazing, and I highly recommend it to everyone, even those not so interested in fashion. His joy and singularity of purpose were mind-boggling, and I wanted to reach out and hug him through the screen. Such a wonderful and inspiring film. After the movie my pal and I went shopping, a dangerous thing the two of us together, thank god it only happens once a year. I fell in love with too many pieces, and as a consequence didn't buy anything (except for, finally, a water bottle). So I put to you my favorites so you can tell me what I need and what I can live without. This blazer with its heavy sturdy herringbone wool in this surprising shock of orange (much more textured and rich in person) stole my heart as soon as I walked into J Crew. This is not just a for-looks blazer, this is a real warm fall jacket, and looks amazing layered with sweaters and hoodies and scarves. This soft cotton button-down has the perfect leopard print on it, almost more cheetah, much more casual edgy safari shirt than wealthy old lady blouse. It fits a little snug on my curvy hips, but as a layering piece it pretty much blew my mind. 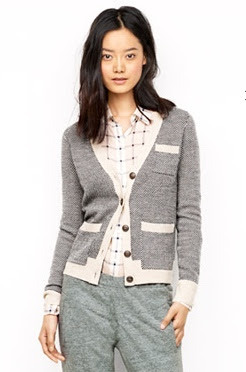 This herringbone cardigan from Madewell looks amazing in a shrunken grandfather sweater kind of way. Though I'm a pretty solid medium at Madewell, I loved this in a small, the contrast of the snug fit and the old fashioned style convinced me in a nanosecond. And the layering and print-combining possibilities are so exciting. This silk shirt, on the other hand, I loved in a large. It drapes so beautifully, and the rusty copper color looked amazing against my rusty copper colored hair. Untucked, over skinny jeans, this would be perfection. So, tell me, what's a girl to do? i love orange, but this blazer is so big and bright that i have a feeling it would dominate everything. I'm torn between the silk plaid shirt and the printlover top... Wow!